Is it just me or is the CAA about the best value going? If you’re an idiot or, like me, a good and loving person who does idiotic things, it’s a godsend. If you’re just bored and curious, try this little experiment. Dump your car in the ditch (not too severely, lest you be legally obliged to contact the police; just enough to be stuck) somewhere on a remote country road. Drain the battery, lock your keys and dog in there and empty the air out of all four tires. Then call the CAA from your cell phone. They’ll show up pretty much anywhere in the province within an hour and get you going again within minutes! Better still, do the experiment with your girlfriend’s mom’s car. The benefits of CAA membership are extended to whatever the member chooses to (legally) drive, not just the member’s vehicle. They’ll perform this service for you 3 times per year for a basic membership. The cost? $85 annually. Isn’t that sort of entertainment worth far more? It gets better. If you’re a real idiot and you discover that your membership has expired after performing the above, you can join on the spot. As well, 14-year-olds can get an annual junior membership. Qué? Isn’t it against the law for 14-year-olds to drive? 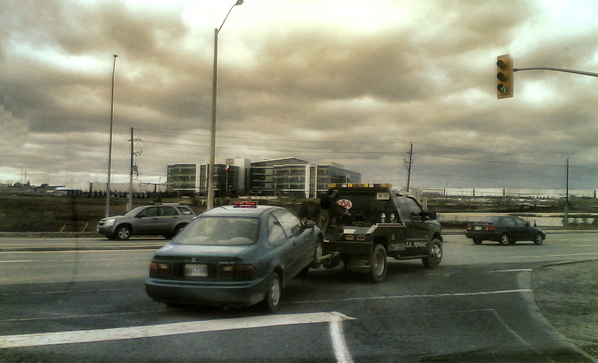 Why offer them towing privileges? There are other reasons I don’t want that generation on the road. Having spent their entire lives in front of screens, they tend to miss social cues and, too blunt for irony, may not realize that the above experiment was suggested tongue-in-cheek. Image courtesy of Irina Souiki.